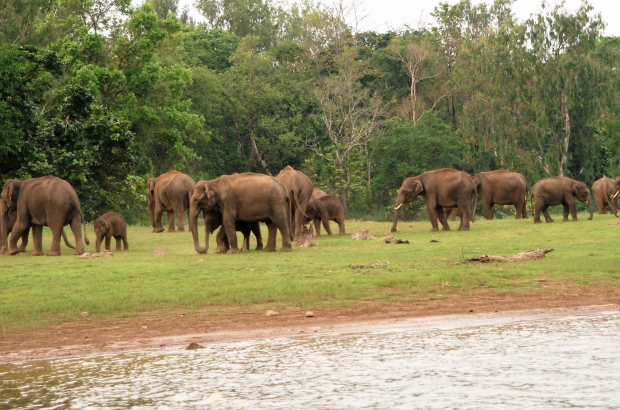 Planckendael animal park in Mechelen has announced the completion of an Elephant Corridor in southern India. The corridor allows elephants to travel safely from one habitat to another through an area that is increasingly turning into farmland. Planckendael bought a crucial piece of land in order to support the Brahmagiri-Tirunelli Elephant Corridor run by the Asian Nature Conservation Foundation (ANCF). Together with the foundation, the animal park purchased a five-kilometre long, two-kilometre wide corridor to prevent it being used by agricultural interests. Asian elephants are under constant threat by encroaching agriculture, one of the two main reasons the population is endangered (the other is poaching). As the elephants roaming area is blocked, they become isolated in smaller and smaller areas, not able to reach food sources and weakened by inbreeding. The corridor is situated between two mountains, and Asian elephants from the surrounding rainforests need to reach the foot of these mountains during the dry season to partake of lush grasses and water sources. The corridor now makes this free passage possible. The ANCF has identified more than 100 corridors in India that elephants use and are crucial to their survival. Many of them have been similarly purchased through agreements with local farmers and governments. Planckendael is home to a family of Asian elephants, including Kai-Mook, the first baby elephant ever born in Belgium. Asian elephants are an endangered species, with some 44,000 making up the population in the Indian subcontinent and South-East Asia. That is such great news! Thank you! The planet belongs to animals and people equally. Many people aren't conscious of this.